UPDATE: The two victims in Sunday's shooting were a 10-year-old girl and an 18-year-old woman, Fox News has learned. 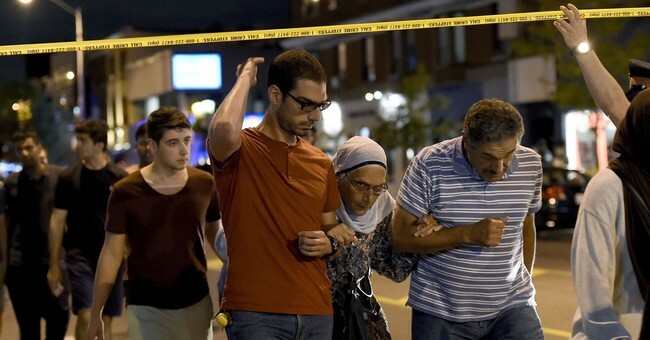 A 29-year-old gunman in Toronto opened fire in a Greek restaurant on Sunday, killing two people and injuring a dozen others, before he died following an exchange of gunfire with police. Authorities are investigating the shooter's motive, including terrorism. They have yet to publicly identify him. A witness did her best to describe the gunman's appearance. John Tory, the mayor of Toronto, suggested that Sunday's carnage is casting another spotlight on the city's "gun problem." "We have a gun problem in that guns are readily available to too many people," he said. "The police are doing their best, but they're operating under extraordinarily difficult circumstances to deal with these guns. And we'll see what they conclude from this case, but it's evidence of a gun problem, clearly." To get a gun license in Canada, residents must pass a background check of criminal mental health, addiction, and domestic violence records, according to a report from CTV. Yet, there has been a noticeable uptick in Toronto shootings in recent years. By July 8, there had been more than 200 shootings in the city, with 26 fatalities, compared to July 2017, when there were 188 shootings and 17 deaths, according to CTV. Further, shootings in the city have more than doubled between 2014 and 2017. Just this past Friday, Toronto had put more police officers on the street as part of its new, $15-million "gun violence reduction plan." Some are questioning the effectiveness of the effort. Toronto Police Association president Mike McCormack called it a "band-aid solution." "I've never seen a climate like this where I've had so many officers come forward, all ranks saying, 'This is absolutely ridiculous,'" he said. "They will go out and do their jobs, and keep the city safe to the best of their ability, but they're not happy about how the chief and the mayor have done this." "